There is no way Dragon Power could have been good. It's a collection of awful components that amounts to more awfulness than the (negative) sum of its repulsive parts. Bandai (strike one, amirite) created a Dragon Ball game in 1986 (i.e. before third parties were really making decent games), and then, for whatever reason, decided to bring it to the American market. The problem, of course, was that in the mid-'80s, nobody in the U.S. had any idea what the hell Dragon Ball was. We had yet to even enter the "$20 for two episodes on a VHS tape" phase of anime fandom, much less the "Dragon Ball on cable" phase. So Bandai did what must have seemed like the logical thing: they didn't release the game hacked out all the recognizable Dragon Ball parts. What was left was a licensed anime game with no license -- and, therefore, no reason to exist. I'm going to discuss the "story" as I understood it in 1986 (insofar as it was possible to understand): Goku and Nora went searching for Crystalballs, I think because they felt like it. Nora immediately got kidnapped by ... something, and Goku had to fight bear-headed guys to get her back. They got help from a turtle and his friend, a hungry old homeless guy who just wanted a sandwich. Then they met Pudgy, who was hiding under an animate statue (and is also represented in-game as a head with two arms attached). That's ... as far as I ever got -- not that the game would have become any more coherent had I continued. Nora: "OKAY, OKAY. LET'S GO ON A TRIP." Goku: "HOW DO WE SEARCH?" Nora: "USE THIS! DRAGON RADAR. NOW, LET'S GO." I love how the idea of "going on a trip" immediately lets Goku know that the pair will be searching for something, which he never has to specify, and for which Nora already has the equipment -- a Dragon Radar, which kind of looks like a purple steak. Nora is then, of course, immediately kidnapped. She periodically pops up in the middle of gameplay to remind you that she's been captured. This pretty much sets the tone for the game. Bandai's effort to de-Japanify the game backfired spectacularly. Dragon Power makes absolutely no sense in its current form. At least had it been a Dragon Ball game it would have had a chance of a story, even if it was a story from some unknown Japanese comic. 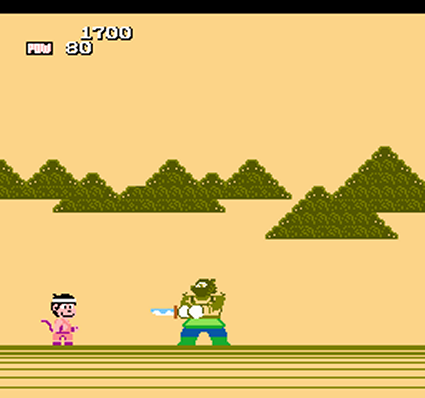 As it is, the dialogue, locations, objectives, and even items (there's some kind of wobbling half-melon thing that, it turns out, is actually a turtle shell, and gives you one Wind Wave attack) are totally inscrutable most of the time. The gameplay doesn't stand up in either version, of course. It's good to know that in this way Japan got almost as bad a game as we did. It's a 3/4 view action game with a lot of nonsensical secret passages -- from the Deadly Towers school of "how the hell did I end up here" design. 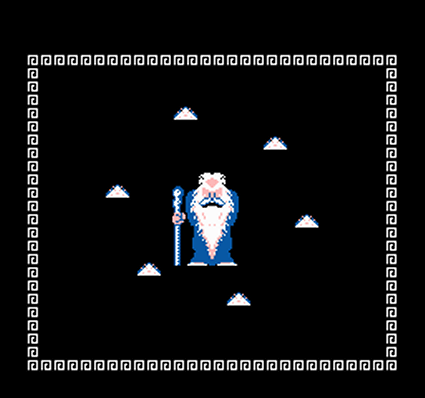 It also shares with that game the "moving up means both moving north AND rising vertically" thing that makes jumping enemies basically impossible to avoid. 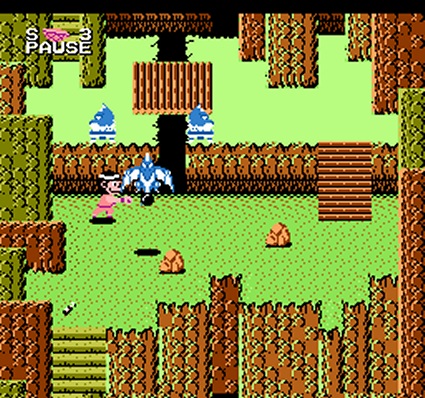 Boss encounters suddenly switch to side-view, and take place against bear-headed, sword-wielding guys. Since their swords are almost always directly in front of them, and since their reach is much longer than Goku's, they drain your life even as you're hitting them. Boss fights, then, become battles of attrition with no room for skill. Awesome. Much like most of the terrible games covered on VO, I admit a certain fondness for Dragon Power. I don't think it's nostalgia, but rather appreciation of the pure randomness of it. Something so haphazardly translated would never make it out the door these days. Trying to construct some kind of storyline out of the half-melons, legless pigmen, and sandwiches here is a lot more entertaining than just a Dragon Ball game.